Noël Coward's play was first staged in London on July 9th, 1926 and ran at the Duke of York's theatre for 132 performances. Initially, the trade press reported that Graham Cutts would be filming the adaptation. 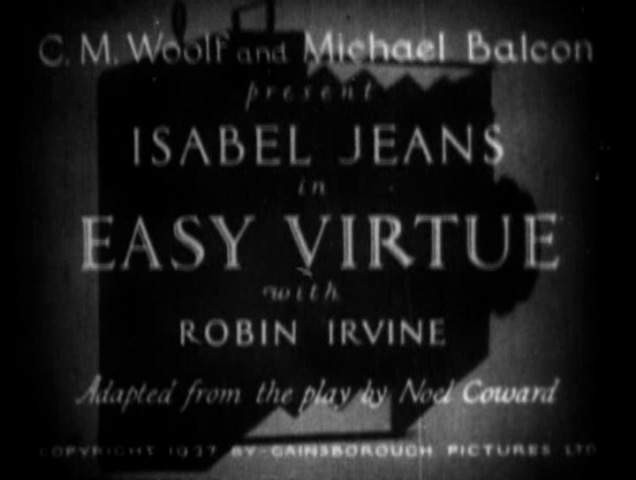 Eliot Stannard began work on the scenario for Easy Virtue immediately after he completed his work on Downhill, with editorial input from Angus MacPhail and Ivor Montagu. Perhaps due to the speed at which the film went into production, many of the cast of Downhill stayed on to appear in Easy Virtue — Isabel Jeans, Robin Irvine, Ian Hunter and Violet Farebrother. Filming began at the Islington Studios on Easy Virtue before the final scenes of Downhill had been shot, as Gainsborough were keen to rush the film into cinemas to capitalise on the popularity of Coward's play. In late March, cast and crew travelled to film footage in the French Riviera and in Nice. Ivor Novello came along as well, in order to complete his Downhill scenes, which were filmed on the rooftop of a French hotel. I had to make the monocle oversized so it would be in focus at close range. Then I put a mirror in it instead of clear glass, and put the attorney character behind the camera, with a double for him in the long shot. And so, when the monocle came up the camera, you saw the man in close-up, without a cut. Although it has been widely accepted that Hitchcock made a cameo appearance in the film — walking past a tennis court — the British Film Institute has cast doubt on it, stating "on close inspection it does not appear to be him". The film was completed in June 1927 and Hitchcock left Gainsborough to start his new three-year contract at British International Pictures (formerly British National). Hitchcock has done the best possible for a subject which does not lend itself readily to the medium of the screen, and he is to be congratulated on having maintained interest throughout with what proves to be very slight material ... In spite of an excellent performance by Isabel Jeans, and Hitchcock's always-apparent resourcefulness and occasional brilliance, this was not one of his more effective films. When Hitchcock discussed the film with François Truffaut, he talked about two scenes in particular. Firstly, he expressed pride in the scene where the audience learns of the outcome of John Whittaker's proposal of marriage to Larita Filton via the facial expressions of a telephone operator (played by Benita Hume). Secondly, he expressed his dislike of the film's final witty intertitle card — "Shoot! There's nothing left to kill." — by calling it "the worst title I've ever written." [Isabel Jeans] is twice referred to, in dialogue titles, as 'the notorious Mrs Filton'; she is oppressed by journalistic cameras, as Bergman is at the opening of "Notorious", and she is hounded in the same way by a mother-in-law who is intent on discovering her disreputable secrets. In the power struggle between the two women, key scenes in both films are played out on the main staircase. The play was adapted again for the screen in 2008 by director Stephan Elliott and starred Jessica Biel. Of all of Hitchcock’s surviving silent films, Easy Virtue has proved the most challenging for the BFI’s restoration team. It survives only in a number of more or less identical 16mm projection prints, all in very poor quality and considerably abridged. The original running time of the film at 7390 feet — amounted to approximately 94 minutes depending on running speed. What survives is equivalent to 5434 feet a mere 69 minutes. We don’t know if a major section is missing or if (more likely) there were dozens, perhaps hundreds, of little trims. We hoped at the beginning of the project that more or better material would turn up, but this has proved elusive. We will of course continue to search. The international search for this Easy Virtue has brought in prints from the U.S., Australia and the Netherlands as well as the UK. Unfortunately, all the existing copies are 16mm prints that have been much projected, resulting in surface wear and tear. All the copies derive from the same source and contain the same printed-in damage. The biggest problem is the underlying picture quality which, thanks to much duplication, is lacking in resolution. Working from such limited material, the best that we can do is to minimize scratches and damage and remake the intertitles. We have chosen the best source and replaced several shots from a second print where they helped to improve quality. All the main titles and intertitles were reconstructed using the original fonts, as in the other Hitchcock restorations. To date, this film has not been officially released on DVD. ↑ Alfred Hitchcock: A Life in Darkness and Light (2003) by Patrick McGilligan, page 93. McGilligan gives May as the month of completion, but Hitchcock was still filming scenes in early June at the Roehampton Club.